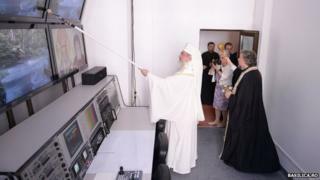 Patriarch Daniel unleashed his unusual blessing technique as he inaugurated the studios of church-owned Trinitas Radio and Television, the Romanian HotNews website reported. Photographs published by the Orthodox Church website show the patriarch carrying out a traditional blessing service, before moving through offices and studios with the roller on the end of a long pole. The ceremony did not go unnoticed by Romania's press and internet humorists, with altered versions of the photos being widely circulated, Adevarul news website reports. One popular blogger posted an image showing the Patriarch apparently endorsing a brand of paint.